So what have I been knitting? First of all I crocheted quite a lot last week. My blanket is quite huge already. I’m in the last colour repeat. I’ll knit the red stripe I started and then from there on another color repeat ending in red so that I get a big red edge. With all that it should be long enough. Then I did my weekly share on my brother’s christmas jumper. It is a no surprise present so I can show you the quite long back part which is already more than 60 rows long and the half as long because it is taking double the time front part. I’m frogged the first 10 rows of colourwork yesterday night and knitted them back but I’m still not perfectly happy with the way the reindeer legs and belly look but I guess I’ll continue and see if it gets better. I’m just not really good with colourwork so far. And then to my reading. 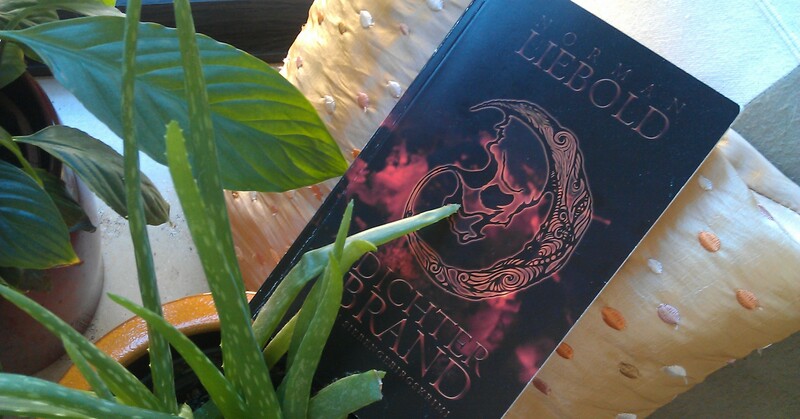 I’m reading a book from someone I know: Dichterbrand by Norman Liebold. He’s a friend of a good friend (who by the way did half of the illustrations in the book and whose work you can find here) and we meet every now and then. Therefore it is really weird to read his book. I can see so much of him in his language and in his characters that I find it a bit disturbing. Other than that it seems to develope into a good crime story based in the Siebengebirge region, south of Cologne. Now to my nails. To be honest this week I’m quite proud of my nail design. I think it looks so cool yet nobody seems to notice it. It is combined of three layers. The first one is mint apple candy by essie, then a slightly smaller layer of 87J, an army green from Manhattan and on top a layer of urban turquoise by maybelline. It is all painted freehand, so no tapes used or the like but that is actually easier than it seems. This entry was posted in Knitting & Crocheting and tagged 87J, Blanket, Crochet, Knitting, Manhattan, Maybelline, mint candy apple, Nailpolish, Sweater, urban turquoise, Yarn Along by kathatravelling. Bookmark the permalink.